Click on Thumbnail for MapIt's amazing the little facts of history learned when reading this book. First we learn of a secret Tennessee city. Now we learn of the lost state of Franklin. Click on the map thumbnail to see the location of this important town in the establishment of a forgotten American state. "Main Street in Jonesboro, solid with step-gabled antebellum buildings, ran into a dell to parallel a stream; houses and steeples rose from encircling hills. After breakfast, I walked snowy Main to the Chester Inn, a wooden building with an arched double gallery, where Andrew Jackson almost got tarred and feathered, for what I don't know. Charles Dickens spent the night here as did Andrew Johnson, James Polk, and Martin Van Buren (whose autobiography never mentions his wife)." Tennessee is full of secrets. That's the conclusion I'm coming to as we make this last stop in the state with William Least-Heat Moon (LHM). I know that in the heady days after the Revolutionary War, nothing was completely settled and the United States had some precarious moments. Lest we think that the new American country was in a love fest with each other and completely united, remember that the new country was rife with divisions. Slavery was an issue that was beginning to be recognized as a major divide between states. The new U.S. government, now faced with responsibilities of running a country, had to now impose its own taxes, and taxes were just as popular then as they are now, which is to say not very popular. The State of Franklin was born out of confusion and frustration with the new federal government of the Thirteen States and anger at the government of North Carolina. The federal government was deeply in debt, so North Carolina ceded 29 million acres of its territory in what is now Tennessee to the federal government to help out. The people living in this area were deeply fearful that Congress would become desperate and sell the land to France or Spain. When Congress didn't act on the North Carolina gift, North Carolina took back its territory a few weeks later. However, the damage was done, and a group of counties got together and declared self-government. 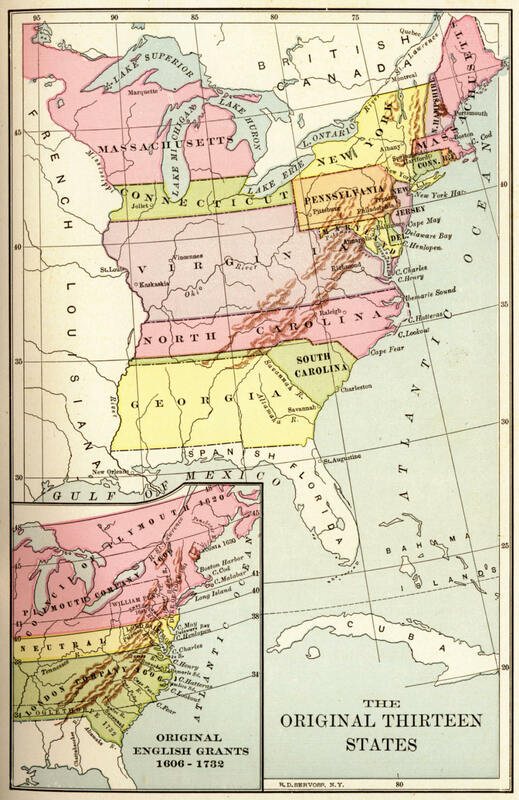 They named their state Frankland, and petitioned the Congress to grant them statehood. Seven of the thirteen colonies supported their petition. However, they needed the support of nine. The Frankland legislature then changed the name to Franklin, in order to hopefully draw the support of Benjamin Franklin, but this did not work. North Carolina sent in troops and established a territorial government, and for a time two governments worked independently of each other. Finally, the arrest of the leader of Franklin, John Sevier, and increasing attacks by Indians on area settlements led to a reunification with North Carolina, who could send troops to aid in defense, and the pardon of Sevier. North Carolina later ceded the territory again to the U.S. government, and it eventually became the eastern part of Tennessee, of which Sevier was the first governor. One person of later historical importance born in Franklin while it was a state was pioneer and participant at the Alamo, Davy Crockett. I find it very interesting that a group of people, right after our country became independent, decided to secede from North Carolina and join the United States in the name of protecting their interests and freedoms. Lest we think that the fledging U.S. was living high on the euphoria of defeating the British and becoming its own country, it is good to remember that we had our own problems and divisions. The debt from the war was very high, leaving the new U.S. government in a position of having to impose its own taxes on the citizenry, who just finished fighting a war in part because of taxes. Taxes were just as popular then as they are today, which is to say not very popular. Freedom is an ideal with many consequences. As a professor teaching American government, I constantly lectured on the balancing act between freedom and other ideals, such as order and equality. The more freedom one wants, the less order can be maintained. The more freedom one wants, the less equality can be achieved. The more order one wants, the more freedoms will be taken away. The more equality one wants, the more freedom is impinged upon. This is the crux of our political battles today. American conservatives cry out for more order. They fund the military to protect the U.S.'s place in the world order. They decry social freedoms as undermining the moral order. Liberals demand more equality as the basis of freedoms. They argue for raising the welfare of the poor and disadvantaged. They push for equal opportunities for disadvantaged minority populations. Demands for order and demands for equality both entail government interference in ordinary lives, and curtail freedoms. Libertarians want to scale government back to its bare essentials, so that freedoms are maximized. However, a country with many freedoms and little order or equality may lead to class warfare and/or a more dangerous, defend yourself world. Government does many good things, and provides us with many services and protections that we take for granted. Thus, maintaining the dream that is the United States of America involves a delicate balancing act. The State of Franklin could not maintain that balance. Seceding from North Carolina may have bought them freedom for a time, but they could not maintain order when the US Congress rejected their petition and then Indians began to attack their settlements. Ultimately, they saw a better mix of freedom and order back under the jurisdiction of North Carolina, and eventually, the State of Tennessee. The history of Franklin also reminds me of the impermanence of human institutions. Sometimes this notion can be frightening or depressing. Franklin didn't last very long, but it is part of a United States that has lasted for about 235 years. Americans tend to see the United States as a permanent fixture, that we will always be a great nation, but this is not guaranteed. The entirety of world history indicates that we will wax and wane, and one day disappear. The Romans had a great empire for nearly 1000 years, yet today their cities are either crumbling away into oblivion or are living museums of impermanence. In a 1000 years, the United States may not exist anymore, done in by war, pestilence, dwindling natural resources, climate change, or the breakdown of our political system. Who knows what country or countries, if any, will occupy the geography we now claim as ours? Perhaps the United States, like Franklin, will be forgotten except by a few - our passage marked by a faded plaque outside a crumbling capitol building in an ancient and deserted city once called Washington. Yet I also find hope in our impermanence. The idea that we can leave something that aids or advances humanity, and the potential that our screw-ups will be heeded or perhaps even be fixed after we are gone, makes me believe that there is some sense of cosmic justice. It's not that what we do now doesn't matter. It does to us, and perhaps it will to the next generations. But in the end and on a universal scale, it probably doesn't matter that much, and in the end, as Julian of Norwich once said, all will be well. Very good Webpage, Continue the great job. With thanks.